Credit: H. Ungati et al. For decades, scientists have used fluorescent probes to detect molecules, monitor cellular activity and deliver drugs inside cells. Probes based on a compound called naphthalimide are especially popular because they can easily be made in large quantities and their fluorescence can be tweaked by changing their constituent atoms. But they are usually absorbed by cells only in small quantities, which hampers their effectiveness. In addition, little is known about how they cross the cell membrane to reach inside. In a new study, researchers from the Indian Institute of Science (IISc) have figured out a way to boost the cellular uptake of such fluorescent probes. They found that simply replacing two hydrogen atoms with iodine in their structure dramatically increases the amount transported into mammalian cells—up to 98 percent. The iodine atoms were found to form a special type of bond, known as halogen bond, with a specific transporter in the cell membrane, which allowed the probe to slip through the membrane more easily. The finding offers a novel strategy to design probes that can be taken up by cells more effectively, the authors suggest. It also reveals for the first time why the presence of iodine in biological compounds such as thyroid hormones is important. "This may give a clue as to why nature chose iodine for such compounds. When they contain iodine, they are taken up by the cells easily," says senior author G. Mugesh, Professor, Department of Inorganic and Physical Chemistry, IISc. Mugesh's team designed several naphthalimide-based probes and tested the effect of replacing some of the hydrogen atoms in their structure with halogen atoms (chlorine, bromine and iodine). For compounds without any substitution, the amount transported into the cell was quite low (~5-8 percent). The cellular uptake increased slightly when chlorine and bromine atoms were added (up to 15 percent and 22 percent respectively). When two iodine atoms were added to the structure, the uptake increased drastically—98 percent of the compound was absorbed into the cell. The team found that the two iodine atoms formed strong halogen bonds with a transporter protein in the cell membrane called MCT8 which then ferried the molecule across the membrane. This suggests that even biological compounds containing iodine probably use a similar transporter and mechanism to enter cells, says Mugesh. 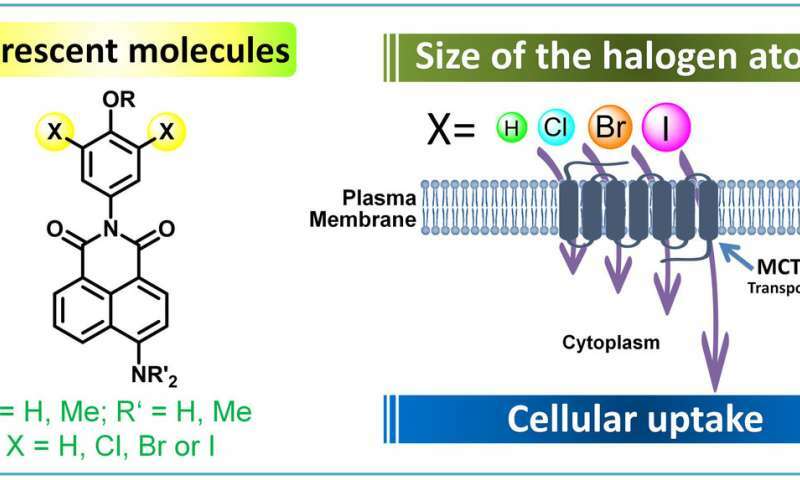 As MCT8 is known to play an important role in the transport of hormones such as thyroxine, such probes could help analyze membrane activity and track hormone uptake, he adds. For example, thyroxine (T4), the hormone secreted by the thyroid gland, needs to be transported inside the cell from the blood, where it gets converted to T3, the active form. "There is no probe to understand how much T4 is transported inside the cells. Generally, it is measured by using radioactive iodine," says Mugesh. "But our method is a simple fluorescent method, which does not use any radioactive compounds, to find out whether MCT8 is functioning properly or not, and if hormone uptake is affected or not." There are also other possible applications. Certain compounds used in food packaging and fire retardants, for example, contain high levels of iodine and other halogens, which are known to enter cells and affect thyroid levels. "To block the entry of those compounds, specific inhibitors are required. These probes may be useful to design inhibitors for blocking their entry," says Mugesh.